This past weekend, I attended the Renton Uwajimaya June Foodtruck Round Up. The rise of the Mobile foodtrucks have been growing popular in the greater Seattle area over the past couple of years and I was able to try two new trucks that I haven't had before. 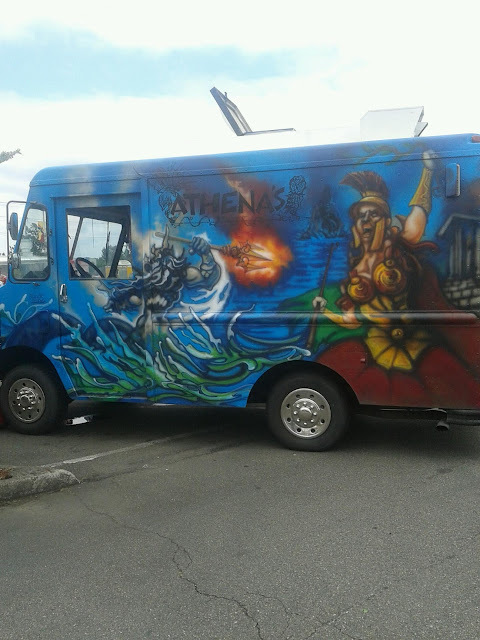 Athena's was the first place I went and their truck was really cool! They had I believe Triton, messenger of the Sea and a Greek warrior (sorry I don't know who it is! Achilles maybe?) painted on the side of their truck. It really caught my eye. I had their Lamb Gyro. It was fairly big and cost $8.00. 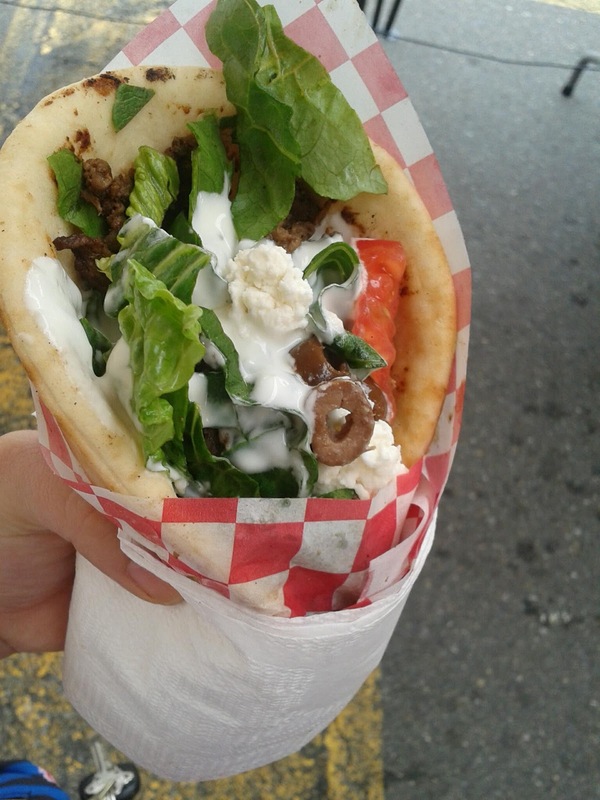 The lamb part wasn't what I was used to (usually the sliced salted and soft lamb I usually have in other gyros). This was more like straight up lamb with not much seasoning and ha a little chew to it. I didn't mind it since the feta and olives gave it complimentary flavor. Overall, I was pleased. You can check out Athena's info HERE. 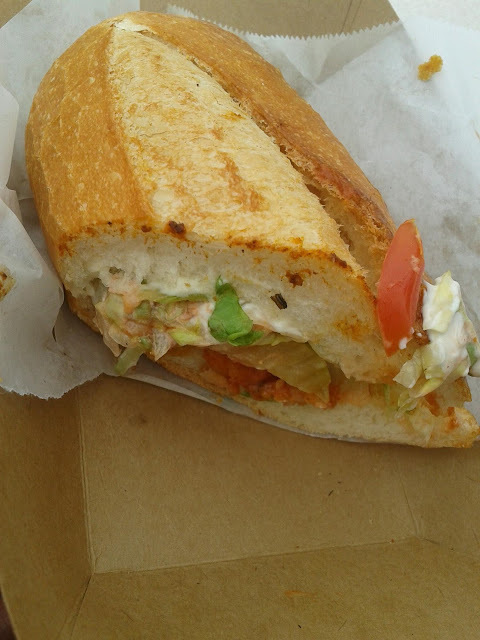 One of my friends had a shrimp po'boy from Jemil's Big Easy, Cajun/Creole food, and I had some of hers. It was absolutely amazing! The dressing/sauce that they put in it really blended well with shrimp which was nice and crunch on the outside, and moist inside. I loved that they used the french bread with it. The texture and mild flavor of the bread paired nicely with the shrimp. Check out Jemil's HERE. Lastly, since I was craving something sweet, I went over to Street Treats, which features a 'build-your-own ice cream sandwhich! 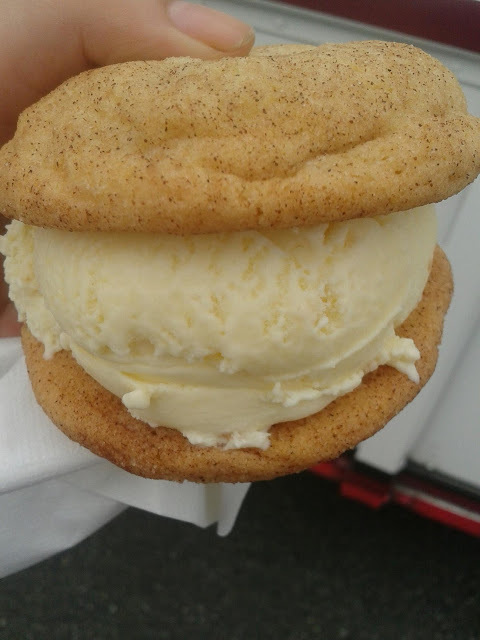 I picked the snickerdoodle cookie to match with the Toasted coconut ice cream! This was absolutely delicious and was a pretty generous portion for a gourmet dessert. It cost me $5.00. The only downside is that the ice cream did melt before I could finish the cookie so it became a little messy. Check out their stuff HERE.